Group name: The table is sorted alphabetically according to the group names. Members: Number of group members in each individual group. Admins: Number of group administrators per group. Click the Manage button to add or remove group administrators. When you delete a group all its content - forum posts, files and pages - will be deleted permanently and cannot be restored. You can change the file quota and the administrators for a group. You can specify a default group file quota in Plugins. This allows you to limit the file space that each group can take up. You get to this page by clicking on the Manage button next to a group on the Administer groups page. File quota: Change the file quota that his particular group can have. Add to or remove administrators from a group by clicking on the Manage button next to a group on the Administer groups page. 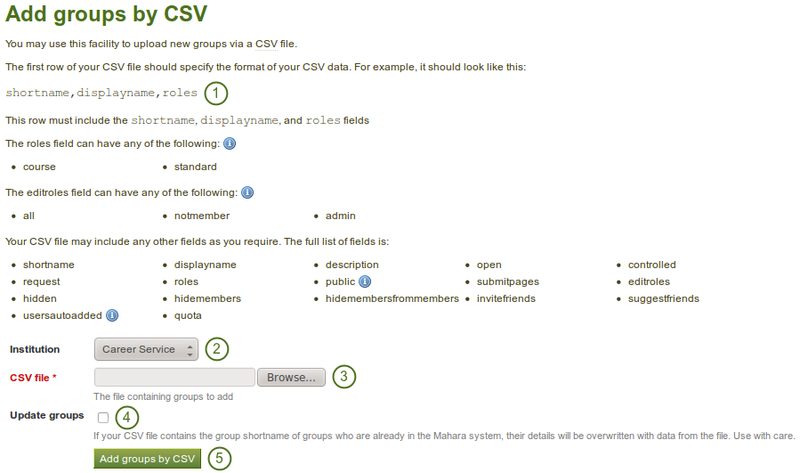 From the list under Potential admins, select the users you wish to make group administrators. You can also select multiple users at once using Ctrl and Shift click. If you have too many users on your and you cannot see / find the person you want, you can search for the user in the Search box. Add the potential administrator to the right-hand side - Current admins - by clicking on the right-arrow button . If you want to remove an existing or accidentally added group administrator, you can remove the user from the list on the right-hand side by clicking on the name. Then click on the left-arrow button , and he user is removed from the list. Enable group categories for the entire site by placing a check mark into the check box and then click on the Submit button. Existing group categories are listed. 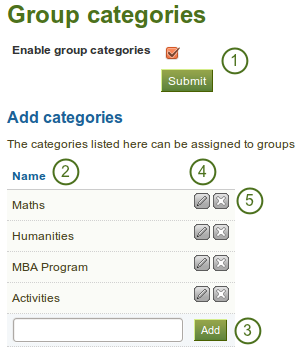 Create a new group category by typing its name and then clicking on the Add button. Edit a group category name by clicking on the Edit button , change the name and then click on the Update button. If you want to abort the action, click on the Cancel button. Click on the Delete button to permanently delete this group category. editroles - You can choose which roles will be allowed to create and edit pages owned by the group. If your group contains only members and admins, then “Group admins” and “Everyone except members” are identical. These edit permissions will also be used by default for new group files. Permissions can be changed on individual files in the group files area. hidden - Choose to list this group on the Find groups page. hidemembersfrommembers - Choose to hide group members from everybody but the group admin. open - Allow users to join the group without approval from the group admin.